FULLY RECLINABLE WITH DOUBLE LOCK SLIDERS. NEW 2 BLACK & RED PVC LEATHER RACING SEATS W/ SLIDERS. PVC LEATHER- BLACK & RED. These seats are designed for universal fit. ALL TOYOTA. 35 lbs each. 2 X TANAKA UNIVERSAL BLACK PVC LEATHER RACING SEAT RECLINABLE DOUBLE LOCK SLIDERS. Heavy embroidery TANAKA logo on back. FULLY RECLINABLE WITH DOUBLE LOCK SLIDERS (Already attached on seat). These seats are designed for universal fit. FULLY RECLINABLE WITH SLIDER. 2 BLACK RED STITCH RACING SEAT. PVC LEATHER- BLACK RED STITCH. These seats are designed for universal fit. ALL TOYOTA. 34 lbs EACH. 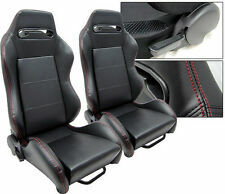 1 PAIR BLACK & RED STITCHING RACING SEATS. Made of PVC Leather- BLACK RED STITCHING. ADJUSTABLE SEATS SLIDERS. Fits on ALL TOYOTA. These seats are designed for universal fit. Sold in 1 Pair. but adaptors (brackets) are not included. 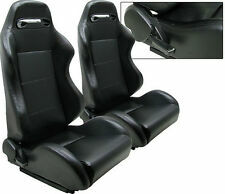 1 PAIR BLACK PVC LEATHER RACING SEATS. Made of PVC Leather- BLACK. ADJUSTABLE SEATS SLIDERS. Fits on ALL TOYOTA. These seats are designed for universal fit. Sold in 1 Pair. Made of PVC Leather(WHITE Area) &. Suede(BLACK Area). 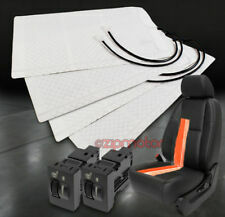 1 PAIR WHITE & BLACK RACING SEATS. ADJUSTABLE SEATS SLIDERS. Fits on ALL TOYOTA. These seats are designed for universal fit. (brackets) from the original seats. FULLY RECLINABLE WITH SLIDER. 2 BLACK CLOTH RACING SEAT. These seats are designed for universal fit. CLOTH- BLACK. ALL TOYOTA. 35 lbs each. FULLY RECLINABLE WITH DOUBLE LOCK SLIDERS. 2 GRAY CLOTH RACING SEATS. These seats are designed for universal fit. CLOTH- GRAY. ALL TOYOTA. 34 lbs each. FULLY RECLINABLE WITH DOUBLE LOCK SLIDERS. These seats are designed for universal fit. 2 BLACK BLUE RACING SEAT. ALL TOYOTA. 1 Pair (1 Right and 1 Left). CLOTH- BLACK BLUE. 35 lbs each. 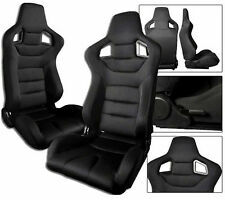 1 PAIR BLACK CLOTH & BLACK STITCHING RACING SEATS. Made of CLOTH- BLACK BLACK STITCHING. ADJUSTABLE SEATS SLIDERS. Fits on ALL TOYOTA. These seats are designed for universal fit. Sold in 1 Pair. but adaptors (brackets) are not included. 1 PAIR RED PVC LEATHER RACING SEATS. Made of PVC Leather- RED. ADJUSTABLE SEATS SLIDERS. Fits on ALL TOYOTA. These seats are designed for universal fit. Sold in 1 Pair. but adaptors (brackets) are not included. 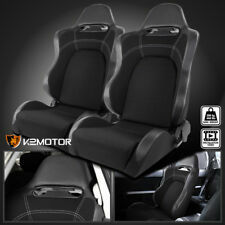 1 PAIR BLACK & BLUE STITCHING RACING SEATS. Made of PVC Leather- BLACK BLUE STITCHING. ADJUSTABLE SEATS SLIDERS. These seats are designed for universal fit. Fits on ALL TOYOTA. Sold in 1 Pair. 1 PAIR BLACK CLOTH & RED STITCHING RACING SEATS. Made of CLOTH- BLACK RED STITCHING. ADJUSTABLE SEATS SLIDERS. Fits on ALL TOYOTA. These seats are designed for universal fit. Sold in 1 Pair. but adaptors (brackets) are not included. FULLY RECLINABLE WITH SLIDER. These seats are designed for universal fit. 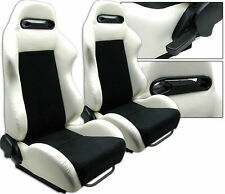 2 WHITE & BLACK RACING SEAT. ALL TOYOTA. PVC Leather(WHITE Area). Suede(BLACK Area). 34 lbs each. FULLY RECLINABLE WITH DOUBLE LOCK SLIDERS. 1 PAIR YELLOW & BLACK RACING SEAT. These seats are designed for universal fit. ALL TOYOTA. 1 Pair (1 Right and 1 Left). PVC Leather(YELLOW Area). Suede(BLACK Area). 1 PAIR BLACK & RED CLOTH RACING SEATS. ADJUSTABLE SEATS SLIDERS. Made of Cloth- BLACK & RED. Fits on ALL TOYOTA. These seats are designed for universal fit. Sold in 1 Pair. but adaptors (brackets) are not included. 2 X TANAKA UNIVERSAL BLACK & RED PVC LEATHER RACING SEAT RECLINABLE DOUBLE LOCK SLIDERS & DUAL RECLINER & BACK POCKET. Hot Stamping TANAKA logo on front & back. FULLY RECLINABLE WITH DOUBLE LOCK SLIDERS & DUAL RECLINER & BACK POCKET. Made of PVC Leather(YELLOW Area) &. Suede(BLACK Area). 1 PAIR YELLOW & BLACK RACING SEATS. ADJUSTABLE SEATS SLIDERS. Fits on ALL TOYOTA. These seats are designed for universal fit. Sold in 1 Pair. Made of PVC Leather- RED & BLACK. 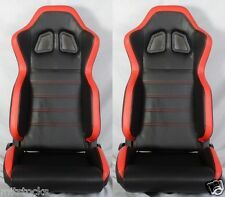 1 PAIR RED & BLACK RACING SEATS. ADJUSTABLE SEATS SLIDERS. Fits on ALL TOYOTA. These seats are designed for universal fit. Sold in 1 Pair. but adaptors (brackets) are not included. FULLY RECLINABLE WITH SLIDER. PVC LEATHER- BLUE & BLACK. These seats are designed for universal fit. 2 BLUE & BLACK RACING SEAT. ALL TOYOTA. 1 Pair (1 Right and 1 Left). 34 lbs each. FULLY RECLINABLE WITH SLIDER. These seats are designed for universal fit. 1 PAIR RED CLOTH RACING SEAT. ALL TOYOTA. We do make custom brackets for any model of vehicle. 34 lbs each. FULLY RECLINABLE WITH SLIDER. 2 BLACK PVC LEATHER RACING SEATS. ALL TOYOTA. PVC LEATHER- BLACK. These seats are designed for universal fit. 34 lbs each. 1 PAIR BLACK CLOTH & YELLOW STITCHING RACING SEATS. Made of CLOTH- BLACK YELLOW STITCHING. ADJUSTABLE SEATS SLIDERS. Fits on ALL TOYOTA. These seats are designed for universal fit. Sold in 1 Pair. FACTORY ORIGINAL - TESTED GOOD. We will install any part you buy from us. Multipl vehicles to choose from. All years and trim levels. Parting CAR and many more. 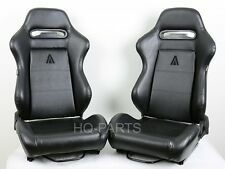 1 PAIR BLACK CLOTH & BLUE STITCHING RACING SEATS. Made of CLOTH- BLACK BLUE STITCHING. ADJUSTABLE SEATS SLIDERS. Fits on ALL TOYOTA. These seats are designed for universal fit. Sold in 1 Pair. but adaptors (brackets) are not included. Made of PVC Leather(BLUE Area) &. Suede(BLACK Area). 1 PAIR BLUE & BLACK RACING SEATS. ADJUSTABLE SEATS SLIDERS. Fits on ALL TOYOTA. These seats are designed for universal fit. Sold in 1 Pair. FULLY RECLINABLE WITH SLIDER. These seats are designed for universal fit. 2 BLACK BLUE STITCH RACING SEAT. ALL TOYOTA. 1 Pair (1 Right and 1 Left). CLOTH- BLACK BLUE STITCH. 34 lbs each. FULLY RECLINABLE WITH SLIDER. 2 BLACK CLOTH RACING SEAT. CLOTH- BLACK. ALL TOYOTA. These seats are designed for universal fit. using your old hardware(brackets) from the original seats. 1 Pair (1 Right and 1 Left). FULLY RECLINABLE WITH SLIDER. 2 BLACK PVC LEATHER RACING SEAT. PVC LEATHER- BLACK. ALL TOYOTA. These seats are designed for universal fit. 35 lbs EACH. FULLY RECLINABLE WITH SLIDER. 2 BLACK RED STITCH RACING SEAT. CLOTH- BLACK RED STITCH. These seats are designed for universal fit. ALL TOYOTA. 1 Pair (1 Right and 1 Left). 34 lbs each. FULLY RECLINABLE WITH SLIDER. These seats are designed for universal fit. 2 RED & BLACK RACING SEAT. ALL TOYOTA. PVC Leather(RED Area). Suede(BLACK Area). Made of PVC Leather(RED Area) &. Suede(BLACK Area). 1 PAIR RED & BLACK RACING SEATS. ADJUSTABLE SEATS SLIDERS. Fits on ALL TOYOTA. These seats are designed for universal fit. Sold in 1 Pair. FULLY RECLINABLE WITH SLIDER. CLOTH- BLACK GRAY. 2 BLACK GRAY RACING SEAT. ALL TOYOTA. These seats are designed for universal fit. using your old hardware(brackets) from the original seats. 1 Pair (1 Right and 1 Left). Reclinable racing seat is adjustable from the handle on the side. Made of high quality black & white PVC leather. Make your car look unique and more aggressive in racing style, provide best comfort, support and safety during hard cornering and aggressive driving. FULLY RECLINABLE WITH SLIDER. These seats are designed for universal fit. CLOTH- BLACK BLACK STITCH. 1 PAIR BLACK BLACK STITCH RACING SEAT. ALL TOYOTA. 35 lbs each. FULLY RECLINABLE WITH SLIDER. 2 BLACK YELLOW STITCH RACING SEAT. PVC LEATHER- BLACK YELLOW STITCH. These seats are designed for universal fit. ALL TOYOTA. 34 lbs each. FULLY RECLINABLE WITH SLIDER. 2 RED PVC LEATHER RACING SEATS. PVC LEATHER- RED. ALL TOYOTA. These seats are designed for universal fit. 34 lbs each. FULLY RECLINABLE WITH SLIDER. These seats are designed for universal fit. 1 PAIR BLACK YELLOW STITCH RACING SEAT. ALL TOYOTA. CLOTH- BLACK YELLOW STITCH. 35 lbs each. 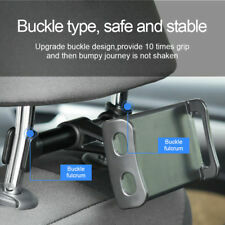 Seat is forward and backward reclinable using the quick release handle. Made of high quality black PVC leather with double red stitching. Comfortable Reclining Racing Seat With Universal Sliders. One Piece Of Right/Passenger Side Racing Seat. FULLY RECLINABLE WITH DOUBLE LOCK SLIDERS. 2 BLACK BLUE STITCH RACING SEAT. PVC LEATHER- BLACK BLUE STITCH. These seats are designed for universal fit. ALL TOYOTA. 34 lbs EACH. 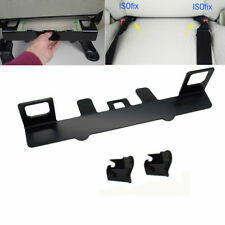 4 Point Cam-Lock Racing Seat-Belt. All TOYOTA. 4 mounting point with quick release cam-lock design. Reinforced high grade nylon belt 2" Width. for 1 seat. Adjustable strap for all size of driver. Never been used or installed. FULLY RECLINABLE WITH SLIDER. These seats are designed for universal fit. 2 RED & BLACK RACING SEAT. ALL TOYOTA. PVC LEATHER- RED & BLACK. 35 lbs EACH. 2000-2002 Toyota MR2 Spyder seats. These will fit all 2000-2005 MR2's, however the design was updated for 2003-2005 models. Includes the passenger and driver side seat. In fair overall condition for their age.